You might be familiar with Facebook regularly throwing heartwarming (or heartbreaking) memories in your face every once in a while, but if you want to take a serious dive into your digital past,. 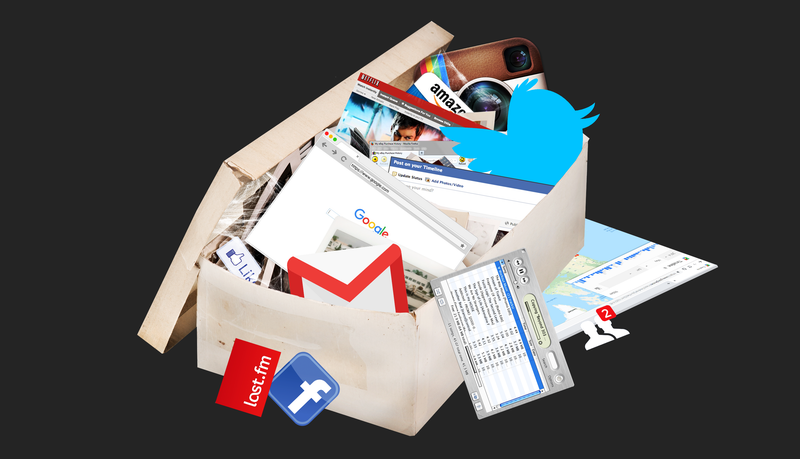 Here’s a guide to dredging into your your digital past on some of the most popular apps and services out there. Google keeps diligent records of everything you do inside its products: Go to the My Activity page in your Google account, click Filter by date & product, then make sure Search is the only option ticked. With some trial and error in the Before date field, you should be able to track down your first Google query (while logged into your account). You can download this data (and all your other Google data) too: You need to go to the Google Takeout page on the web, then pick Search under My Activity (plus anything else you want to save). Click Next, then Create archive, and when you download and unpack the resulting archive, you’ll find a long, long HTML file with all your search history in it. Don’t like that Google has all this information about you? You can delete it. Facebook loves surfacing memories in the News Feed but you can go back to your earliest posts easily enough. Scroll down your profile page on the web and you’ll see a drop-down menu appear at the top—click Recent then pick the earliest year listed to see the posts from that year (if you’ve entered our birthday into Facebook, that will be the first one). You can also get your entire archive of Facebook content, if needed, via your Facebook information page : Click View next to Download your information, then Create File. Download and unpack the archive that Facebook sends to your inbox, open the index.html file, click any entry—like Your posts or Your photos—and scroll all the way to the bottom. As with Facebook, you can download your entire Twitter archive to disk—open your account settings page on the web, click Request your archive, and when you’ve downloaded it from the link in your inbox, open up the index.html file in your browser. Click to the earliest year and month from the table on the right to see your oldest tweet. It’s easier to navigate this archive than it is to scroll through your timeline on the web, though you can of course use the advanced search feature if you know when your earliest tweets were. If your Twitter archive is full of JSON rather than HTML, you’re probably testing the new Twitter interface—revert to the current one before requesting your archive. Click the All Mail link on the left of the Gmail interface on the web, and you’ll see the total number of emails in your account up in the top right-hand corner, above the messages: “1-100 of...” however many you have. Click on this number range to bring up a drop-down menu, then choose Oldest to go to the earliest page of emails in your Gmail account. Unfortunately, this isn’t easy to do from modern-day music streaming apps like Spotify and Apple Music—while there are History and Recently Played tabs inside the desktop apps for Spotify, they don’t stretch back particularly far, and for the time being at least there’s no way of digging into the database to find the first song you ever streamed. If you’re a seasoned iTunes user then you can tap into the metadata in your media library to see what the first song you played was—at least since you last moved computers or started a new library. Click Songs, then the Last Played heading twice to see the earliest play (right-click on the column headings to get Last Played on screen if you can’t see it). Those of you who scrobble to Last.fm will know it’s fantastic for logging and retracing your listening history across multiple apps and services—if you’re not already a user, consider signing up. Go to your listening history on the web, click on the oldest year listed, and you can remind yourself of all those songs you were enjoying back through the years. Want to see how your app habits have changed over time? On an iPhone, open up the App Store then tap your profile picture in the top right-hand corner. Choose Purchased to see all the apps you’ve ever installed, whether they were free or paid-for—if you scroll all the way down to the bottom you can see the very first app you installed with your Apple ID. Over on Android you can get to a similar screen from the Play Store app: Open up the app menu, tap My apps & games, then tap Library to see everything you’ve ever installed on Android. Apps are sorted reverse chronologically by default, so keep scrolling all the way to the bottom of the list to eventually discover the first app you ever installed on a device. Log into Netflix on the web, hover the cursor over your account avatar (top right), then click Account. If you go to Viewing activity you can see what you’ve watched on Netflix recently, but there’s also a Download all link—this gives you a CSV file you can open up in a spreadsheet program to go back and look at everything you’ve ever watched on Netflix. Your browsing history is typically limited by when your browser was installed and when you last bought a computer (or reset your current one), and going back to the start usually involves a lot of scrolling. Google Chrome is the exception, because your browsing history is stored on the web too, and you can filter by date to go back to the earliest entry logs. For your local browsing history, it’s History then History again from the Chrome menu, Library then History then Show All History from the Firefox menu, History from the Microsoft Edge menu, and History then Show All History in Safari on a Mac. None of these interfaces make it particularly easy to jump back to the first browsing records though. Google Maps of course tracks you everywhere you go, if you let it: If you’ve got the Timeline feature enabled, you can open up Maps on the web and click back to whatever date you please. Use the drop-down lists at the top to see where you went in a particular year, in a certain month, or on a specific day. Timeline is available in the mobile apps too. Apple is less comprehensive in the tracking it does but you can see places where your iPhone has regularly found itself, if location services are enabled. From Settings, tap Privacy, Location Services, System Services and Significant Locations, which are shown as a list in reverse chronological order. You can clear the list from here too. Your eBay purchase history may well be a mixture of bargains and regrets, but if you want to go right back to the beginning of the story, log into the site on the desktop then click My eBay and Purchase history. Under the Orders section, click The last 60 days to change the search criteria for orders, then pick the earliest year listed to see what you bought first. Finding your first post or your first activity isn’t possible on every site and app. On Instagram, for instance, you’ve got no option but to scroll, scroll, scroll and scroll some more back to the beginning. Don’t forget you can get at your Instagram profile on the web, which might make it easier than having to thumb all the way down inside a mobile app. Messaging apps like WhatsApp and Facebook Messenger don’t make it particularly easy to find your oldest message: Older threads are further down the conversation list, of course, but group chats that have updated more recently might have the oldest entries overall. You can see the oldest messages in any specific thread by scrolling to the top (or bottom).